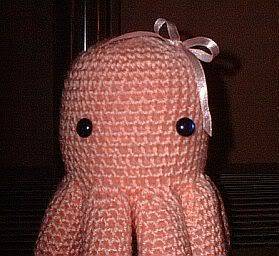 Craftster Community > CROCHET > Amigurumi: Completed Projects (Moderator: pottermouth) > PepperKitty's Octopus! Thank you so much for such a cute pattern PepperKitty!! 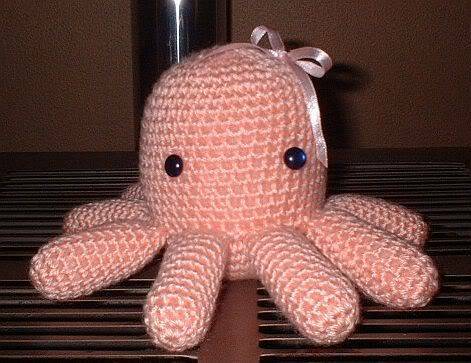 I also shared with the wonderful people on Crochetville! that is so cute!!!!!!!!!!!!!! i want one! ok -I LOVE LOVE LOVE that! The bow is cute and I just love the two different positions. How adorable and cavity-inducing! I'm so going to have to try my hand at that one. My friend'd die if she saw it! "just keep crafting, just keep crafting"
Sorry I've been gone so long. Am trying to get back on the boards. Body's thrown me for a few loops these past months and am still learning to adjust. Thanks for your patience. You did a great job! 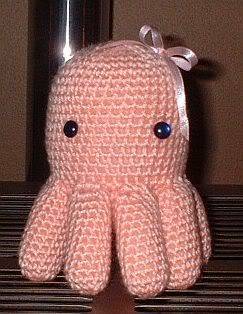 It's super cute and adorable in that baby pink color! sooo cute! i love it! is it stuffed with regular batting?